Captain Cook Square is a large open air shopping centre located in the heart of Middlesbrough. Opened in 1999 the centre has many familiar high street retailers including Waterstones, The Entertainer, Wilko and Poundland. The shopping centre is comprised of two large open public squares with stores surrounding each and the small street that connects them. In early 2017 Captain Cook Square approached our partner about getting some Outdoor Digital Signage for the shopping centre. Looking to further engage with their customer base Captain Cook Square wanted to use Digital Signage to display adverts for the various brands within the shopping centre. They were looking for a partner to help deliver and install a commercial grade solution. Taking Digital Signage into an outdoor public environment always comes with its own set of challenges. Readability is a big issue with sunlight causing a screen to be unreadable if the display is not bright enough. Weather is also a big factor to contend with, any viable commercial display needs to be able to withstand any weather condition such as rain. This also means regulating the screen’s internal conditions to keep the LCD panel at the optimum temperature for the best performance. A strong enclosure is not only needed to keep out the weather but to make sure the display itself is vandal proof. An outdoor environment is a lot more difficult to control and that is why the extra precautions are needed. Captain Cook had a couple more specific requirements for this project; they wanted a simple solution for updating the screens’ content and wanted to ensure that the installation of the screens, as well as any future maintenance, would be as easy as possible. It was obvious that an IP-rated outdoor solution would always be needed with this project; the main choice would come down between a wall mounted or freestanding screen. 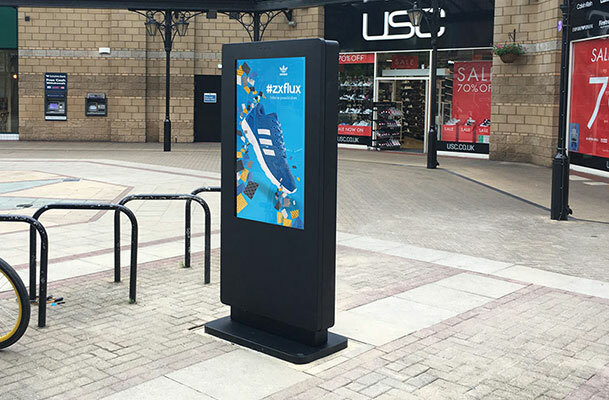 Due to the limited wall space around the precinct and the ability to mount the screens in an area with high footfall we supplied three 49” Outdoor Freestanding Digital Posters. This is a proven commercial outdoor solution, with a brightness of 2,500 cd/m² these screens are over 8 times brighter than a standard domestic television – ensuring the display can be seen even on the brightest of days. 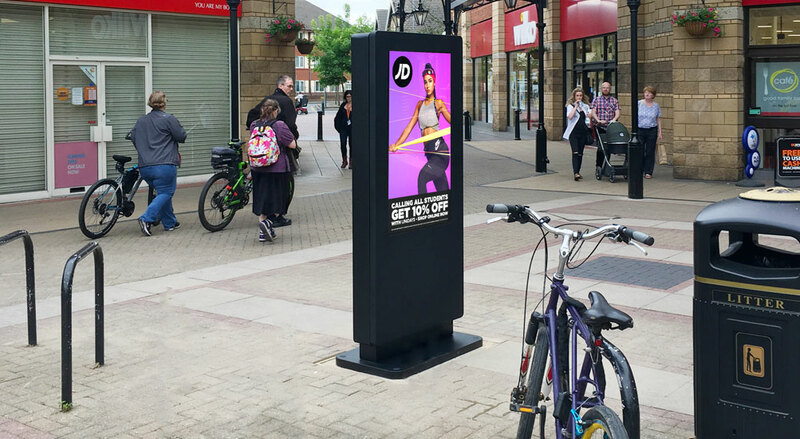 The Outdoor Freestanding Digital Posters have an IP65 rated mild steel enclosure that means it can protect against weather and vandalism. As the standard climate in Middlesbrough is moderate, the screens smart temperature control system is more than capable of keeping the screen at the optimum temperature. In terms of Captain Cooks more specific requirements we would normally recommend updating an Outdoor Advertising Display over the internet for convenience, Captain Cook Square investigated the viability of connecting each screen via LAN or over 4G but ultimately found this unviable, so the decision was made to make each screen standalone. This means that each display is individually updated via a USB; a compromise that Captain Cook Square was willing to make. Their other requirement for the easy maintenance was met as these displays feature easy front access. The front lockable panel lifts up and is supported by two hydraulic arms, making the internal components easily accessible for maintenance while also being locked away. The four Outdoor Freestanding Digital Posters were installed at Captain Cook Square in June 2017. The screens were mounted in carefully chosen locations to make sure that they maximise on footfall. One screen was mounted near to the bus station entrance that is adjacent to Captain Cook Square; the other two screens were mounted in each of the public squares. 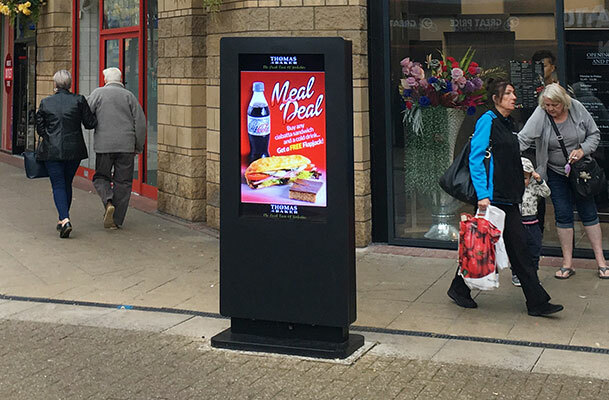 With the Outdoor Digital Signage in place the shopping centre is now able to actively help promote its various businesses by displaying their adverts on the screens. As their first major exploration into Digital Signage the Outdoor Freestanding Digital Posters are helping to make Captain Cook Square a great shopping destination.